A FIRE at the boat house at Thames Ditton Marina has damaged nearby boats. 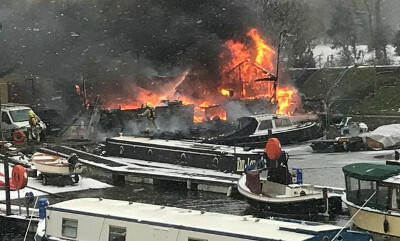 The fire yesterday started in the boat house by the side of the moorings on the Thames at Ditton Marina, but spread to nearby boats, Alan Tilbury reports. The building was of wood construction and contained inflammable materials so keeping the fire service busy for hours attempting to get it under control. Luckily the fire people, wearing breathing apparatus, managed to removed nearby gas cylinders, preventing a catastrophe. However, a number of boats moored nearby suffered damage.